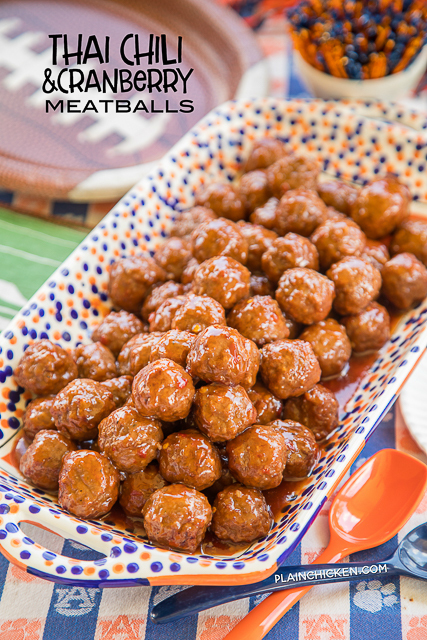 Do you need a super easy appetizer for your upcoming football parties? Well, look no further! 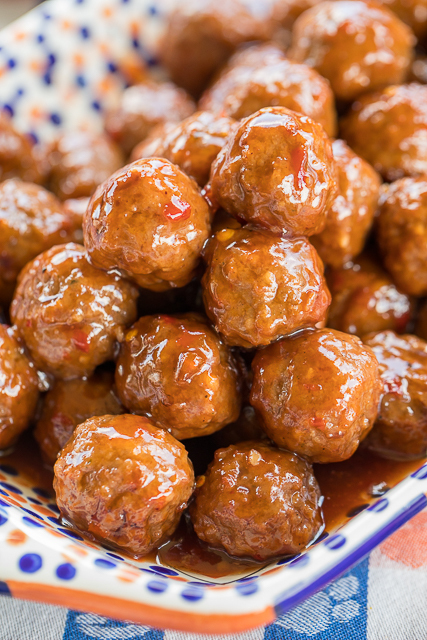 These Thai Chili & Cranberry Meatballs are ridiculously easy to make and ridiculously delicious! The best part is that there are are only three ingredients.You can make these in the slow cooker or on the stove. I’ve made them both ways and they are great either way. I usually make them in the slow cooker for parties. I like to let guests serve themselves straight from the slow cooker. These Thai Chili & Cranberry Meatballs are great as an appetizer, but you could also serve them as a main dish over some rice or noodles. We ate these for tailgating and had the leftovers for lunch the next day. They were delicious both times!!! 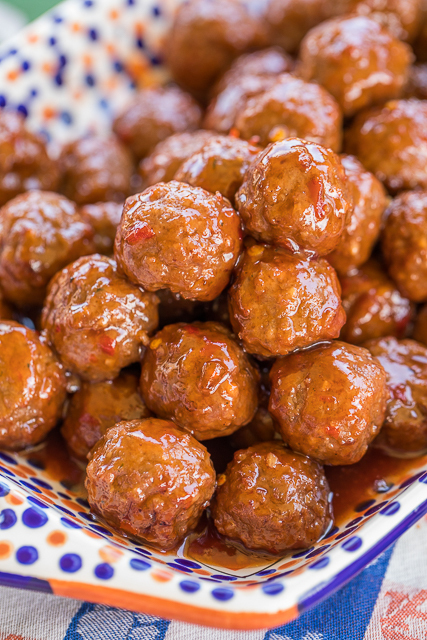 I’ve made these Thai Chili & Cranberry Meatballs several times over the holidays. They were a hit every single time! I just love how easy they are to make. 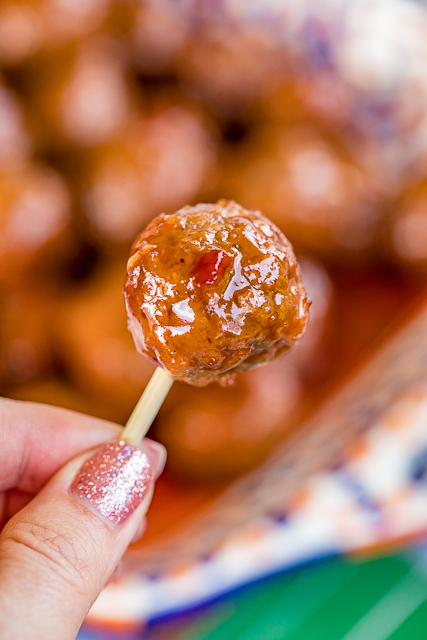 I always have the ingredients on hand so I can whip these yummy Thai Chili & Cranberry Meatballs anytime we get the craving! If using a slow cooker, combine all ingredients in a 6-qt slow cooker. Cover and cook on LOW for 1 to 2 hours. Either is fine. I used sweet because that is what I could find. I plan on adding a tbl of curry pwr and lemon juice to half of this recipe. I will let you know how they are received if you are interested. Both variations were a big hit. Can't call a winner here. It was a draw. I used cumin instead of curry and that was a good move. Two of the three couples left with the recipe. Both of these will be saved and used over and over. Thanks, Steph. I also used Maggi Sweet Chili Sauce. What kind of meatballs did you use? Just whatever brand is on sale at the grocery store. I like the smaller 1/2 ounce size. I never use the larger 1-ounce size meatballs.